Which 'Quick Sale' option is best for you? The only way to 100% guarantee a fast sale is by selling to a genuine cash house buying company. Find reputable cash property buying companies! Help. I've just lost my buyer! The ‘quick sale’ industry is a murky place. The stress of needing to sell fast makes you vulnerable. There is no shortage of companies out there waiting to take advantage of anyone who’s guard is down. Now more than ever, you need to remain ultra-critical of any promises being made to you, by any of the companies you come into contact with. Needing to sell your house fast significantly elevates stress levels – this can cause even the most intelligent person to act in haste and make poor choices. Since 2005 we’ve spoken to (or been in email conversation with) over 15,000 homeowners all united by a need to sell quickly. Almost all were experiencing a state of extreme stress. This guide has been created to ensure you have all the information you need to make sound choices. Contrary to popular opinion, not all companies that will buy your house for cash are evil (although a fair few are). For a tiny proportion of house sellers (that need 100% certainty their sale will complete within a specified timeframe), the reputable firms out there provide a valuable service. When should i consider this method of sale? 1. You need / want a guaranteed exchange of contracts within 1 – 4 weeks. 2. You need / want guaranteed cash in the bank within 8 weeks. 3. There’s enough equity in the property to allow you to accept a discounted offer price roughly 20% below fair market value. See: Who are the best cash house buying companies? Facing repossession? Here’s quick tip. If you’re experiencing financial difficulty, please don’t bury your head in the sand and leave it till eviction day to ask for help. Selling at a discount to a ‘we buy any home’ type company is often not your only option. It is possible to get lenders to back off and give you more time to sell on the open market (and get a good sale price). Auction can be a great way to sell your home fast. The problem is it’s not guaranteed to work, and only works well for very specific types of property. Should I put my property into auction? A) Has significant refurbishment or development potential. B) Is rare, desirable and hard to value. C) Is income producing (or has potential to produce income). D) Is blighted by a serious problem that takes expertise to solve (such as a defective title). E) You’re prepared to let it go at a significant discount to market value. Bottom Line: If your house doesn’t have a ‘money making’ or ‘income producing’ angle, don’t expect it to generate much interest at auction. Don’t expect all auctioneers (or estate agents affiliated to any auction platforms) to give you honest advice about whether your house will sell at auction. Some are so desperate for the opportunity to make a sale; they may nudge you towards an unsuitable method of sale. Auctioneers & affiliated estate agents that get paid their ‘marketing fee’ (regardless of whether your property sells) have little incentive to tell you the truth or give you best advice. If you need a guaranteed sale, think very carefully before you choose auction over a reputable fast house buying company. The big problem with auctions (especially online auctions) is that your property is publicly advertised with a low guide price on Zoopla & Rightmove. If your property does not generate much interest at that level, and is either withdrawn prior to auction or doesn’t sell at auction, this failed attempt to sell (at a low price) will have been seen by most of the home-hunters active in your local market. This will cause you problems with any future marketing of the property, and is highly likely to reduce your achievable price, speed of sale and interest levels. 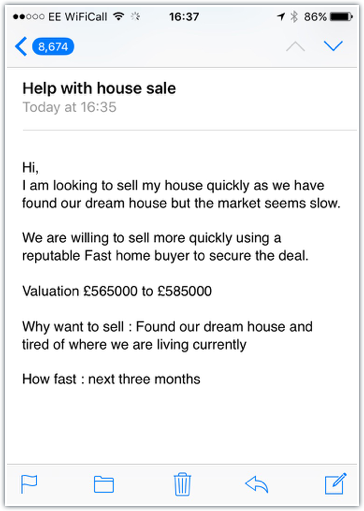 Lets say you’re on the market with a traditional estate agent at £200k and you lose your buyer (perhaps they couldn’t get mortgage finance or their buyer pulled out). 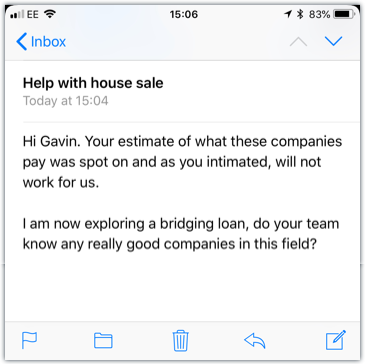 In this scenario, cash house buying companies will be using a figure close to £200k as a starting point for calculating their offer. If instead you go down the auction route with a guide price of £180k and you fail to sell, cash house buying companies will now be minded to use this lower figure as their starting point for calculating their offer. Your failed auction attempt provides cash house-buying companies with fairly compelling evidence that your house is unlikely to achieve £200k on the open market from a buyer that can go the distance. They may well have previously been thinking £195k was an achievable selling price and so their offer would be 80% of £195k (approx. £156k). Now, their offer will be 80% of £180k (approx. £144k and that’s a best case scenario). Bottom Line: If your property is not suitable for auction (and you need a guaranteed sale), be very clear that a failed auction attempt will have a negative impact on the price you could achieve from any companies that buy houses for cash. If you’re facing the possibility of now not being able to complete on your dream home, you have our sincerest sympathy. The stress can really knock you for six and make you vulnerable to misleading claims and aggressive marketing. Be warned, we’ve witnessed countless smart people make really regrettable choices under these circumstances. You get word your buyer has pulled out. You search frantically for fast house sale solutions. You start talking to ‘we buy any house’ type companies. Some are honest about what they do and pay. Some are deliberately misleading and looking to take advantage of you. Bottom Line: No genuine company can pay more than 80-82% (85% in exceptional circumstances) of what they feel they can sell the property relatively quickly for (on the open market). The companies to avoid are the ones claiming to provide a fast sale at 90-100% of market value. They tend to be called ‘quick sale estate agents’ and they’re usually (but not always) the sister company of one of the cash house buying firms you will have contacted. This claim is misleading – there is no database of cash investors (it just sounds good). In reality, they do nothing more than list your property on Rightmove (at a low price) and hope the phone rings. Alarm bells should go off if anyone asks you to sign any sort of ‘tie in’, ‘option’ or ‘agency’ contract. Also, avoid anyone asking you to sign a ‘RX1’ form. …If they are also asking you to sign any of the above – WALK AWAY! …Then selling to a cash house buying is a viable option. If you need closer to 100% of your property valuation, there is no guaranteed solution. What does exist is a smorgasbord of tactical moves you can make to increase your chances of finding a replacement buyer quickly. Drop your asking price to generate fresh interest. Offer significant personal bonus to existing agent (only payable if you complete your sale within your required timeframe), if they can generate a fresh buyer quickly . Instruct a second agent to work in competition with your existing estate agent (on a winner takes all basis) + possible asking price tweak. Offer ‘buyer incentives’ like free legals or Stamp Duty paid. Negotiate extra time with the vendor of the property you’re after (they may not have any other interest) + explore possible offer of a non-refundable deposit to show commitment. Do nothing and hope a new buyer materialises and accept the property you’ve agreed to buy may be lost. Take on a bridging loan (a very high risk option). Bridging loans are short-term loans secured against property. They are intended to cover a temporary shortage of credit. As such they’re a viable way to break a property chain (or replace a buyer that’s pulled out at the last minute) and purchase a new property while waiting to complete the sale of your old one. If your house sales hits any bumps in the road, or takes longer than expected, your interest repayments can get quickly out of hand. In fact, if PropCast™ rates your market as cold or very cold don’t even bother starting to investigate bridging. When is it safe to consider bridging? It’s safe only when you’re absolutely sure of your exist strategy (i.e. you’re sure your house sale will complete within an acceptable timeframe). You will need 100% confidence in your estate agent, the advice they’re giving you and their ability to push the sale through to exchange of contracts. Have a firm (and qualified) offer on your property. Wait until your buyer has booked their mortgage valuation. If it’s a cash buyer, wait until they’ve booked their survey and you’ve seen proof of funds (such as bank statements or solicitors letter). Consider the risk of an adverse survey (or legal searches) highlighting problems that cause your buyer to pull out of the deal. When not to consider bridging? As mentioned, the risks involved in taking on this sort of debt can’t be underestimated. If your buyer is in a chain – forget about it. If you don’t yet have an offer on your property – forget about it. If you don’t have 100% confidence in your agent – forget about it. If you are selling in a cold / weak market – forget about it. …’Quick Sale’ companies weren’t going to pay enough to allow Mr Gibbs to make his move. I checked PropCast™ and and quickly saw his local market was cold (i.e. long time to sell, buyers extremely price sensitive and buyers thin on the ground). I told him this and explained just how risky I thought taking a bridging loan would be for him. As an alternative, I suggested he speak to one of our master house sale doctors who could diagnose the best strategy to get his home sold quickly on the open market. A day or so later, Mr Gibbs updated me on his position. Sadly there is absolute no guaranteed way to ‘sell quickly’ and ‘get full market value’. Who’s in the market right now. Note: Keep in mind the timeframes above are all averages. They’re a good starting point for setting expectations but they do hide wide variations. Read: How long should it take to sell your house? In the chart above we looked at average times to reach key milestones. The state of your local market will have a profound impact on your ability to sell quickly. 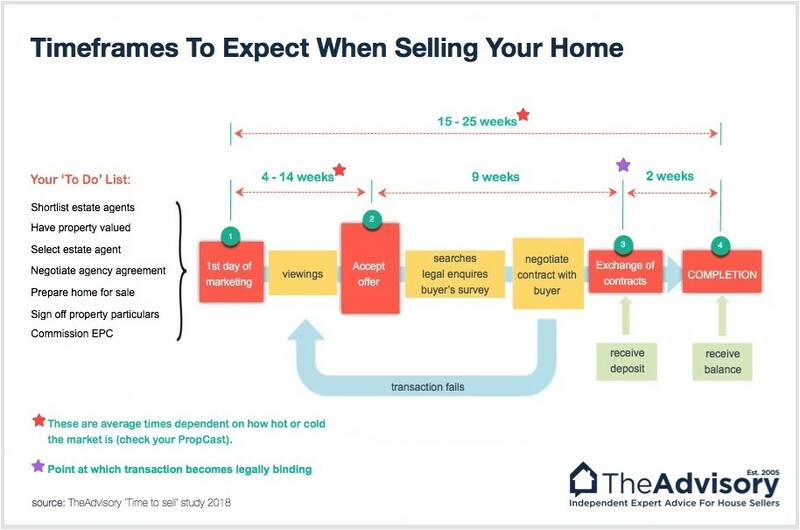 In a sellers’ market (hot market) there are loads of active buyers and so your chances of selling quickly are greatly increased. You may have no choice but to accept that selling your home is going to be an open-ended waiting game. You then have to sit and wait for that one buyer to bite (or enter the market). Help you set realistic expectations for you sale. Prompt you to make / explore alternative plans (if necessary). Help you avoid making poor financial choices (e.g. taking on a bridging loan when trying to sell in a cold market). Help you decide whether your best strategy is to sell your house first before making any offers on new homes. Help you identify honest estate agents that give sound advice. Not everyone has the luxury of being able to do this. If you do, know this, the property market is continually in a state of flux. There are seasonal variations and so if you want to sell quickly, its best to avoid coming to market around November – December & July – August. Read: When is the best time to sell my house? Most house sellers wait until they get an offer before instructing a solicitor to act for them. Issue you with a Property Information Form & Fixtures and Fitting Form. Request a copy of your lease and management pack (if selling a leasehold). This can cut at least two weeks off typical timescales. If you’re worried about abortive costs, don’t be, loads of excellent conveyancing firms now work on a ‘no move no fee’ basis. Pro Tip: If you want to sell quickly, avoid suspiciously cheap conveyancing services. Cheap conveyancers are cheap for a reason…They take on too many clients. That means your transaction will be one of 100’s your conveyancer is dealing with at anyone time. You and your buyer’s solicitor will end up waiting ages to get a response to even the simplest enquiries. It will be highly frustrating for all involved and can potentially kill your deal if your buyer gets fed up and finds something else to buy. Searches are enquiries submitted to various authorities, which then provide information about the property being bought (they usually have a 6-month shelf life). Ordinarily it’s the buyer that orders and pays for the searches, and some buyers can drag their feet putting their solicitor ‘in funds’ and able to order searches. What’s more, searches can take a long time to get back dependent on the local authority and whether your buyer opts for ‘personal searches’ or the cheaper (but potentially much slower) ‘official searches’. Coal & Brine search (location dependent). You can save significant time if you take the bull by the horns, get these searches yourself and then gift them to your buyer (or ask them to pay a contribution). Expect a typical suite of searches to cost £200-£300. Talk to your solicitor about whether this is a suitable strategy for you and your property. As a seller you’re going to need to produce various certificates and fill in a number of mandatory documents. Do this early and get them together in one file so you can quickly lay your hands on them when requested by your buyer’s solicitor. Tip: It’s odd; FENSA certificates always have a habit of getting lost. For a quick sale on the open market, it will help if you make the effort to prepare and present your house so it’s immediately appealing to buyers. A thorough clean, fresh paint, new carpets and giving the garden a once over will give you the biggest bang for your buck (in the shortest time). As such you would be wise to do some homework and see what sort of condition other competing houses (on the market) are in. Then you have a decision to make. Do the work to match them or drop your price to account for the difference. For example, if you’re asking the same price as a house that has a completely renovated kitchen you’d better make sure your kitchen is also updated. If you decide not to renovate the kitchen you; either have to drop the price or have some other selling features that justify the comparable price your asking for your house. Forget about what Zoopla thinks your house is worth – Zoopla will not buy your house. Forget about what other properties have sold for in the past – today’s buyers can’t buy them. Focus on looking at the market through the eye’s of today’s buyers. 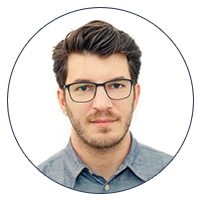 Understand that all buyers are engaged in what is basically a massive comparison shopping exercise. They have a budget and are comparing all the properties that interest them, to see which one provides the most value (for the price being asked). The one that does this usually generates the most interest & sells first. Selling fast is basically a matter of putting your competition out of business with tactical pricing. I’ve chosen apples because they are all unique (like houses) and all provide roughly the same value (as do houses within a similar price bracket). You go down to the local apple market and find you’re up against the 3 apples above (32p / 30p / 34p). Your apple is of a similar quality but you’ve not got time to hang around, you need to sell your apple fast and get on with your life. What price would you ask for your apple to give yourself the best chance of being bought first? Don’t overthink it, it’s exactly the same with houses. What are the other properties on the market that the buyer of my property is going to be giving serious consideration to? How does my property compare to these properties? Where do we need to position my house against these properties to make mine stand out as the best value for money? How far below the competition do we need to price my house to generate offers? Pro Tip: Ask these 4 questions BEFORE the estate agent has given you their opinion of your property’s value. Estate agents are notorious for overpricing houses as a tactic for winning new business. You want to avoid being swayed by an estate agent that is deliberately overpricing your home in an attempt to impress you. Asking too much money or “testing the market” are sworn enemies of the quick sale. Your best strategy is to price your house competitively below the competition. Experienced house sellers take a strategic approach to estate agency selection. i) The agents with the potential to generate the most interest in your property are the ones currently selling (and recently sold) above average numbers of similar properties in your price bracket (in your local market). ii) The reason being – Each of these properties act as a piece of cheese attracting potential buyers to that agent (these buyers then go on the agent’s applicant database). iii) Simply put – The agents with the potential to get you the most interest in your property are the agents with the most amount of cheese. iv) A good agent’s role is not just to stick your property on Rightmove and wait for the phone to ring. A good agent will be proactively contact all suitable buyers on their applicant database and encourage them to view your property (and encourage them to offer on it too). v) It’s a fallacy that all sales originate directly from a portal enquiry. Many buyers end up buying a property they initially passed over when viewing it on Rightmove / Zoopla. vi) This is common sense really (but often missed). After all, a buying decision cannot be made from looking at photos. It can only be made once the property has been experienced. vii) A good agent’s role is to make sure as many people as possible “experience” your property so they can make an informed buying decision. Pro Tip: Estate agents that do sales & lettings are most likely to be in touch with local property investors & landlords. These types of buyers are most likely to be chain-free and cash funded (i.e. able to reach exchange of contracts quickly). When you need to sell fast, you need your estate agent to bring their “A-game”. Instruct 2 estate agents to work in competition with one another on a winner takes all basis (highly recommended). Pro Tip: Multi agency is the preferred method of sale for almost all experienced (and professional) house sellers. It has proven over time to be the most effective way to motivate estate agents and encourage them to prioritise a sale (over all others). Anything proactive you can do to stimulate interest and make your property stand out is worth consideration. We often offer buyer incentives to give our properties the edge in a crowded (or slow) market. Below, is a list of buyer types in order of ability to proceed quickly. There are lots of caveats to this but it’s as good a start as any when it comes to appreciating not all buyers are the same. Finding a buyer is often the easy bit – It’s getting to exchange of contracts that’s hard. Ideally, you’re looking for a chain-free cash buyer, as they should be able to exchange contracts the quickest. However, there is no guarantee you’ll find one. As such, getting under the skin of any potential buyers’ financial position and ability to proceed is essential. This needs to be done before you accept an offer and it’s your estate agents responsibility to provide you with the information you need to make an informed decision. Not all estate agents are great at this. Some are too keen to get a deal wrapped up and try to push things through without checking the facts and obtaining the correct details. What’s the status of every link in the chain below your buyer? What’s the buyer’s financial position? Does the buyer have an agreement in principle from a mortgage lender? If they’re buying with cash have proof of funds been seen? Please do not take mention of any company below as an endorsement or recommendation. What is an assisted sale? In a typical house sale, you instruct the estate agent and essentially you become the project manager of your sale. Decide whether the estate agents are giving you the right advice at every step of the process. However, in a ‘Type 1’ assisted sale, you get the help of a third party expert assisted sale specialist who will project manage the entire process for you, and make sure you hit your target completion date. Not least, they will micro manage the estate agents and make sure they’re acting in your best interests (at all times). Genuine assisted sale specialists are usually found working for asset management companies and large property services groups. They are employed by corporate entities looking to help homeowners gain more certainty over the outcome of their home sale. Home Builders – they offer assisted sales because they want to make sure your house sale completes, in order to make sure you’re in a position to buy one of their new builds. Mortgage Lenders – they offer assisted sales because they want you to sell for full market value quickly, and avoid having to repossess you. Corporate relocation specialists – they offer assisted sales so you can relocate as quickly as possible and get back to work. Some ‘Quick Sale’ companies offer this as an alternative to buying your home outright for cash. For an outright purchase, typically a guaranteed cash offer will be 80% of market value. Some companies claim to pay 85% but this is only if you take up their Assisted Sale Scheme. The Quick Sale Co (QSC) agree to pay you a sum equivalent to 85% of market value. You sign an option contract and are locked into the deal for the contracted term. QSC gives you a 5% cash deposit and you vacate the property. QSC takes over the responsibility for all outgoings and mortgage payments. QSC puts the property on the market for sale with an aim to achieve as close to full market value as possible. When (and if) the property sells, QSC keep everything (after costs) achieved above 85% of market value. Only when the sale completes are you paid the 80% balance owed to you (you’ve already had a 5% deposit). You get access to 5% equity in cash relatively quickly. You get to walkaway from having to pay the mortgage (and other outgoings) while the property is being sold. You have no control over timescales. It is not a guaranteed sale. You give away 5-15% equity for what is essentially a Type 1 assisted sale (which should only cost 2.5-3% inc.VAT on a ‘no sale no fee’ basis). You get tied in via option contract which potentially can last as long as 12 months. The property (and your responsibility to pay the mortgage) may come back to you unexpectedly. WARNING: If a ‘Quick Sale’ Co. is offering you an assisted sale service, take independent legal advice before signing any paperwork – especially if there is any mention of option agreements. TheAdvisory believe many ‘Type 2’ assisted sale services being proposed provide poor value to house sellers. If you would like our opinion on any proposal being put you to, don’t hesitate to get in touch. Fair market value (FMV) of a property is the price a willing buyer would pay (subject to securing finance). What you need to sell the property for. What you bought the property for + the cost of any improvement projects. What a buyer (that has a property to sell) has offered you. What an estate agent gives you as their opinion of value. An RICS valuation (although if the only interest in your property is from a buyer that requires a mortgage, then to all intensive purposes this IS fair market value). At the end of the day, until a property sale completes, all attempts to define fair market value are just guesses. Hopefully the estate agent advising you is making a good guess based on relevant facts and evidence in the marketplace. Never the less, their guess is not gospel and often inaccurate because ‘deliberate overpricing to win the instruction’ is rife in the UK estate agency industry. Can i trust online reviews for house buying companies? Fake reviews (and even online video testimonials) can be easily bought online. 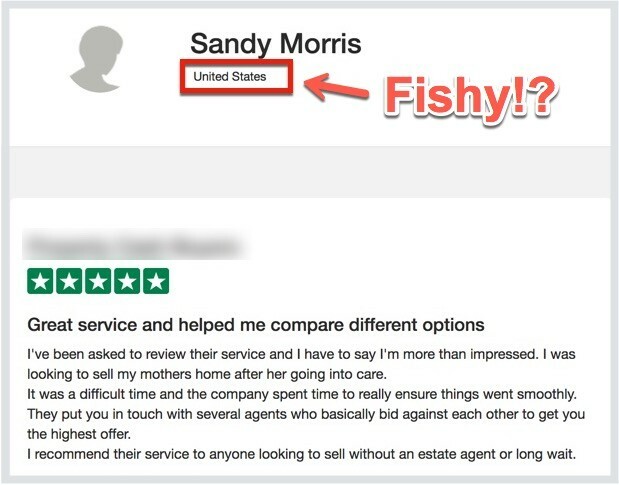 Facebook and Google reviews are harder to fake (compared to 3rd party dedicated review websites like Yelp, Trustpilot and Feefo) but are also not immune to manipulation. Quick tip: To check if a company is faking their reviews, take a look at which country the reviewers are from. Are instant cash offers or online quotes accurate? Before an offer (you can rely on) can be made, all cash home buying companies will need to spend 3-5 days doing research to work out what will be a realistic purchase price for your property on the open market. Local estate agents will be interrogated and a number of other property market data sources will be analysed. This is why ‘initial offers’ (received over the phone or from an online calculator) aren’t worth the paper they’re written on. In reality, shopping around and making a good decision is impossible (if basing your decision purely on a comparison of initial offers). …These teaser rates are inaccurate figures thrown out there to get the conversation started (and get a foot in the door). Whoever offers the most at the ‘phoning around’ stage usually pays the least when it comes to the ‘handing over the cash’ stage. Who are the National Association of Property Buyers (NAPB)? 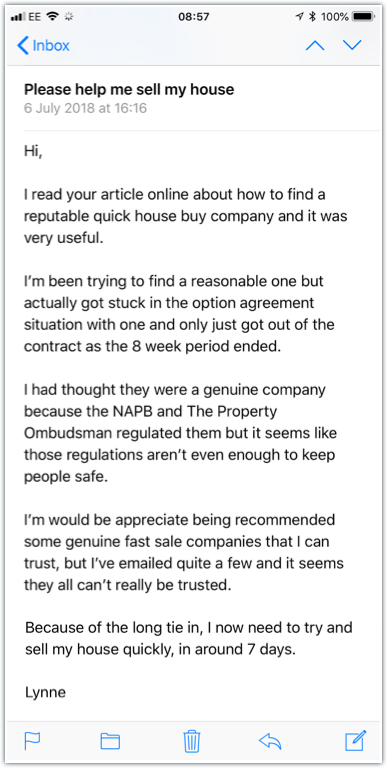 The NAPB are a self interest trade body that represents a number of companies operating in the quick house sale sector (England, Wales & Northern Ireland). There are a few excellent companies. There are also some of the worst companies in the industry. …The Quick Sale industry is NOT regulated. Anyone that claims differently is either mistaken or trying to mislead you. All we have is a voluntary redress scheme (and code of practice / conduct) overseen by The Property Ombudsman. Members of the NAPB have signed up to this code of conduct. …It did nothing to protect Lynne. In fact it seems to have done more harm than good, and only served to lower her guard by providing a thin veneer of credibility to a company that didn’t deserve it. Bottom Line: Do not take membership of the NAPB as a guarantee the company you’re dealing with is reputable and will treat you fairly. Who are the best sell house fast companies? Ultimately, this depends on what type of property you’re selling, and where it’s located. There are 100’s of websites out there all claiming to provide a guaranteed cash sale (and even pay your solicitor fees). …If you’ve never dealt with these companies before it’s impossible to to know who to trust.